Today is Pike Place Roast Day. 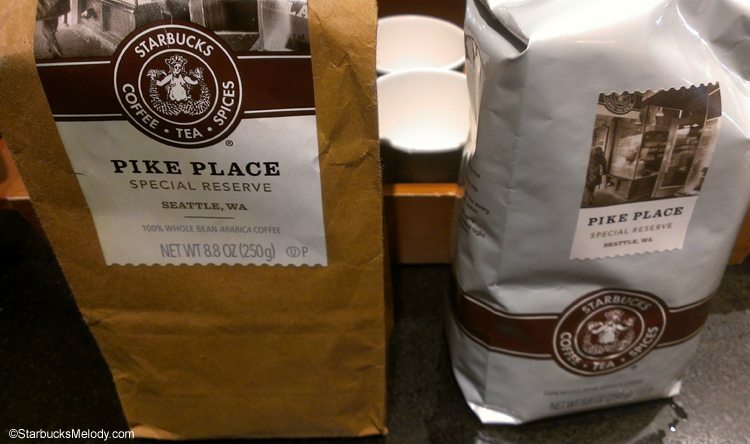 Six years ago today, Starbucks introduced Pike Place Roast into their coffee lineup. 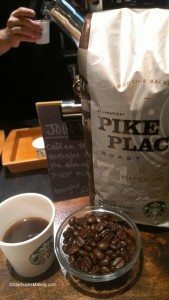 In honor of Pike Place Roast Day, I asked Coffee Master Jordan if he would use Pike Place Roast for an East Olive Way coffee tasting. He was happy to do so. 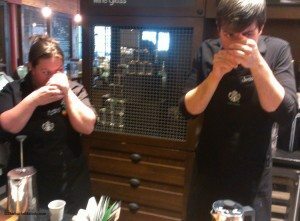 We tried this coffee and Pike Place Special Reserve made via a French Press and compared it to Clover-brewed versions of the two coffees. Pike Place Special Reserve is roasted darker than Pike Place Roast. You can see it when you compare the beans side by side. We paired the Pike Place Special Reserve with the La Boulange chocolate croissant. This was a great pairing and the chocolate in the croissant brought out the dark chocolate flavors in the Pike Place Special Reserve coffee. The Pike Place Roast (the everyday brew) was paired with the La Boulange Classic Coffee Cake. The Classic Coffee Cake was delicious with the Pike Place Roast, as it brought out lots of cinnamon flavor notes. I really liked the Clover version of each of the two coffees. 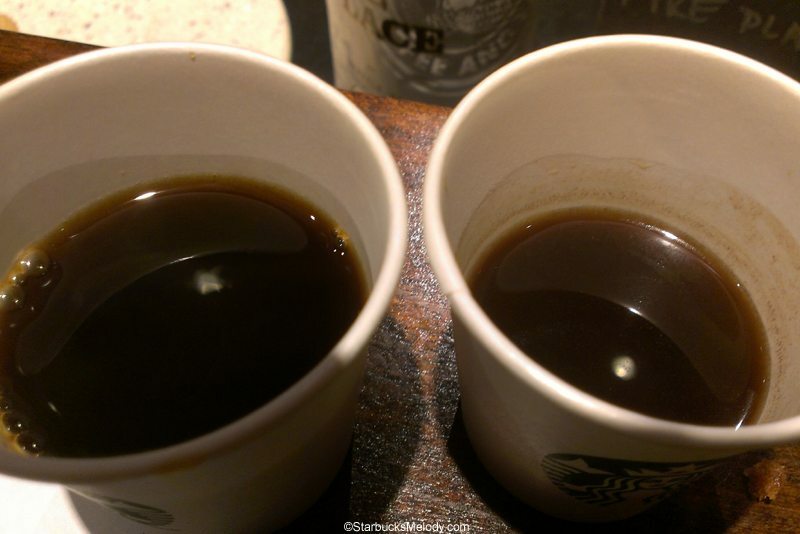 I’m always amazed at the stark difference in sediment between Clover brewed and French pressed. Can you tell which is which here? I appreciate Jordan doing Pike Place Roast for the coffee event. I wanted to write more and put in more photos but I’m having some WordPress problems. April 8, 2008, Pike Place Roast was launched into the Starbucks coffee lineup. The coffee masters at the headquarters wanted to develop an “Everyday Brew” to be served all day, everyday in stores. Starbucks Coffee Masters know that flavor is a geography: A motto that used to hang on the whole bean menu signboard in the 1990s era of Starbucks. But for customers who didn’t understand how growing regions and processing methods can change the coffee flavor, the ever-rotating flavor profiles in stores confused them. It was an unsettling surprise to one week drink a bold, caramelly coffee, and then next week drink a coffee that was lighter in flavor with lemony or fruity flavor profile notes. 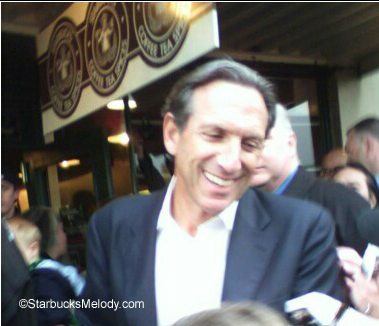 Some customer’s thought, “Starbucks is messing with my coffee.” And so six years ago today, with great historic fanfare in Bryant Park in NYC and on the red bricks in front of 1912 Pike Place, Pike Place Roast was introduced into the world. Then-Seattle Mayor Greg Nickels dubbed April 8, 2008, “Pike Place Roast Day” in Seattle. 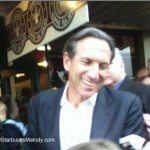 Howard Schultz proudly introduced the new coffee to the world. Starbucks made history with a coffee! I was there on launch day at Pike Place Market and snapped this photo of Howard just after he finished his speech about the all-new coffee. Starbucks Global Month of Service. Cool Off with These Refreshing Starbucks Drinks. Starbucks Ethiopia Gemadro, Guatemala San Isidro estate coffee, and Costa Rica La Candelilla coffee. 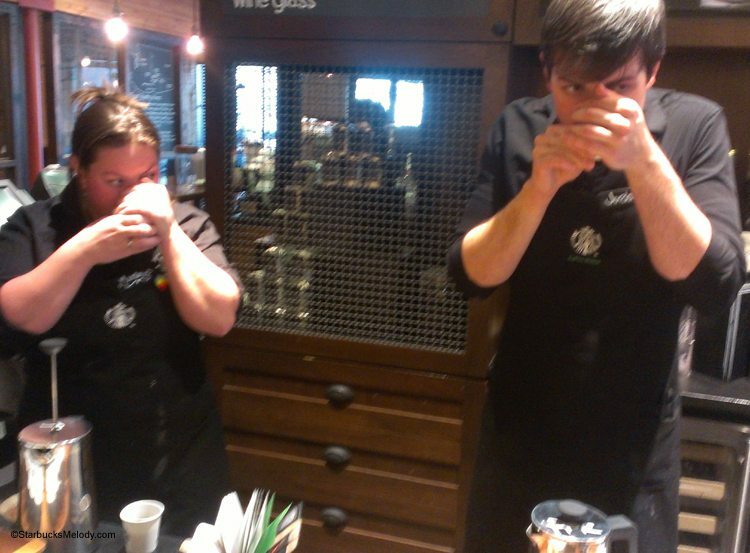 East Olive Way Starbucks: Join In on a Coffee Seminar & have a Flat White. Any funny Starbucks beverage certificate stories? The Digital Starbucks Coffee Passport: For both customers & partners! Lots of people don’t know about Fall Blend. It’s an unknown Starbucks gem. I started with Starbucks on the 22nd of that same year and the energy of that year (Espresso Excellence, PPR) really drew me into the company. That said, is it a co-incidence that PPR Day is the day after National Beer Day?? @GreyGhostX – Congratulations on 6 years with Starbucks. And thank you for making a comment. I’m having some site problems like you wouldn’t believe. For many people, this site appears down because their browsers will time out when trying to load it. 🙁 So glad you made it by! Wow, time has flown by. I remember the launch, and how cool it was then to see when the batches were roasted, and I believe a location was provided too (written in chalk on the displays?). Were they in brown paper bags? I don’t remember, and back then I didn’t save ev-ery-thing. – Is the one on the right the Clover? Melody hope the site problems are resolved as yes it has been difficult to read posts and write comments. Great post! I wonder why SB did not do a major promotion at every store and do tastings. That would have been quite nice. @Purple1 – Thank you for sticking it out! It might be a while before these technical issues are really resolved. My readership is way down but it appears that directly related to the fact that the site is hanging and not loading for some people. Visits dropped precisely when the technically problems started. I did a tasting in which we compared Pike brewed in a Press and Pike brewed in the flat bottom brewers. It was really interesting. We paired it with the Salted chocolate almonds we sell. Amazing pairing! I get the Pike Place marketing thing but why do all the Starbucks coffee shops stop brewing the good stuff after 12:00 PM? 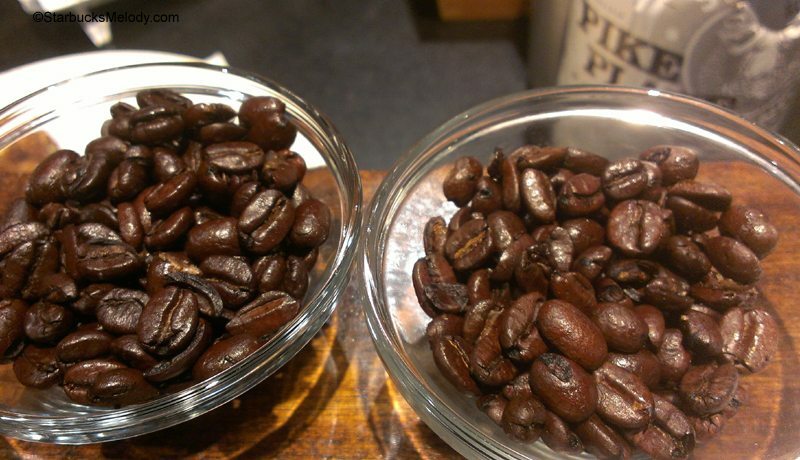 Having the Strong and Medium roast selection any time of the day was a differentiator for Starbucks. Yes, I can get a “pour over” any time buts it’s not the same as the bulk brew. Great post. Just another reason for me to get out there. Wish we could buy all these special coffees anywhere. But I guess that takes away from the specialness.